ISLAMABAD: The Gojra-Shorkot section of the National Motorway M4, a part of the Pakistan Economic Corridors Programme (PECP) to promote regional trade, tourism, and economic growth in the country, was inaugurated on Saturday. Parliamentary Secretary for Ministry of Communications, Mian Muhammad Shafique, and Parliament Member Riaz Fatyana inaugurated the section, which was constructed with the support of the Asian Development Bank (ADB) and the UK’s Department for International Development (DFID) under the PECP. The ADB provided $178 million in financing for the four-lane, access-controlled 61-kilometer motorway, while DFID provide $92 million in grant financing, a statement said. The motorway is part of the PECP to upgrade highway networks connecting the country’s southern and northern parts, helping improve road links between Pakistan, Central Asia, and China. Yang said it would also provide people better access to basic facilities including health and education. “The new section of the motorway is a step forward in Pakistan’s expanding high quality roads to facilitate improved north-south connectivity and to help position the country as a trade, tourism, and industry hub,” she added. She said UKAid was pleased to be part of this important road project. “We hope this will help farmers to transport their produce from farm to market faster and cheaper, improving their productivity and prosperity,” she added. The Faisalabad-Gojra 58.2km section, which has been completed with ADB support, was open for traffic. The opening of the Gojra–Shorkot section would further shorten travel costs and time for people and goods moving from and towards southern Punjab, the statement said. 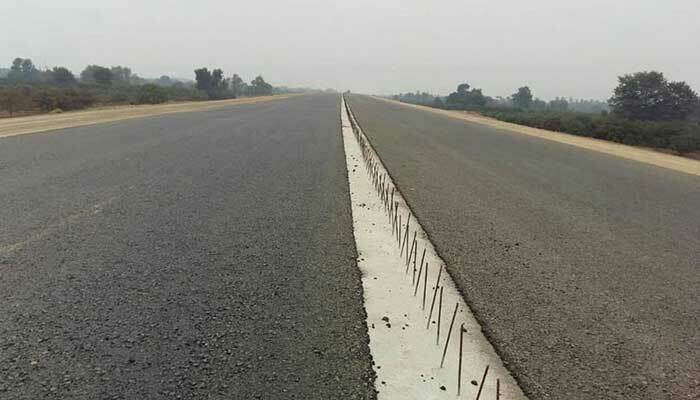 Meanwhile, the 65.28km Shorkot–Khanewal road section, which was co-financed by ADB, DFID, and the Asian Infrastructure Investment Bank (AIIB), was now under construction. Once completed, the M4 would connect Faisalabad with Multan and ultimately provide an efficient transport corridor link between the northern part of the country with the port cities of Karachi and Gwadar. It would also link up these cities with the existing networks of national motorways M1, M2, and M3, shortening the distance between South Punjab with central and northern urban and business centres including Lahore, Islamabad, and Peshawar. The transport sector contributes about 10 percent to Pakistan’s gross domestic product. It was estimated that 2.3 million people or about six percent of the total employed labour force of Pakistan earned their livelihoods from this sector. Meanwhile, road transport also dominates the country’s transport system, accounting for almost 96 percent of freight traffic and 92 percent of passenger traffic. Much of the country's 12,500km national highway network was old and dilapidated, impeding the efficiency and safety of road transport in Pakistan. ADB was committed to achieving a prosperous, inclusive, resilient, and sustainable Asia and the Pacific, while sustaining its efforts to eradicate extreme poverty. Established in 1966, it is owned by 67 members—48 from the region.